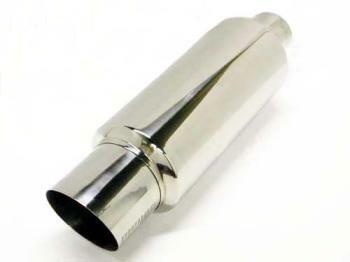 The M-GT Universal Muffler is one of Megan’s best selling products. It’s popularity can be attributed to it’s real race car look, feel, and sound. It will give better responses on higher RPM. Available with 2.5” (Standard) or 3” (Turbo) inlets. 4.5” tip, 2.5” or 3.0” inlet, total length 19.5” and body width 6”.